People are living longer these days. This is due to improving lifestyles and better access to quality medical care. Most of the dreaded diseases of the modern world are preventable, if only risk factors are picked up and controlled early on. So when one is at the peak of one’s career, health must be regarded as an asset that needs to be protected. Heart attack, stroke, diabetes, dementia and even cancer are just some of the diseases that can be avoided by maintaining a good lifestyle and close monitoring of one’s overall health. Never before has preventive medicine been regarded as both fashionable and prudent. In a busy executive’s stressful life where there does not seem to be enough time to attend to everything, health concerns are often set aside. This brief talk is all about the importance of wellness, of a balanced lifestyle, of preventive medicine, and how to easily incorporate all of these in our busy lives. 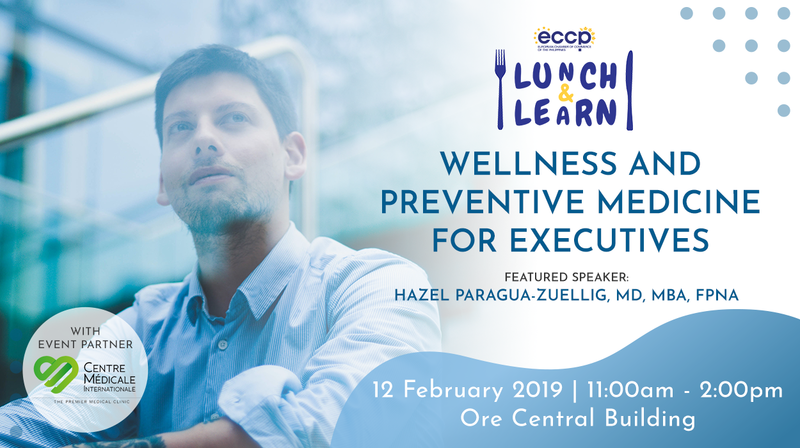 Dr. Hazel Zuellig is a practicing neurologist at the Cardinal Santos Medical Center and the new Centre Médicale Internationale in the Bonifacio Global City. She graduated from the University of the Philippines College of Medicine and did her residency training in Neurology at the Philippine General Hospital. She has special interests in epilepsy and chronic pain management. She attends to general neurology cases in both her clinics. Dr. Zuellig represents the Philippines in international fora on epilepsy, public health and access to neurological medications. Dr. Zuellig holds a Masters Degree in Business Administration and is currently the President of the Z Healthcare Asia Holdings Corporation, a company that operates specialty clinics in the Philippines.